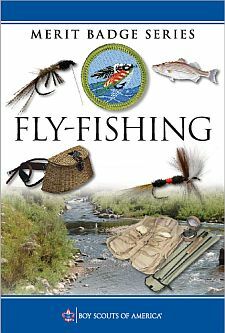 Explain to your counselor the most likely hazards you may encounter while participating in fly-fishing activities and what you should do to anticipate, help prevent, mitigate, and respond to these hazards. Name and explain five safety practices you should always follow while fly-fishing. Discuss the prevention of and treatment for health concerns that could occur while fly-fishing, including cuts and scratches, puncture wounds, insect bites, hypothermia, dehydration, heat exhaustion, heatstroke, and sunburn. Tie backing to the arbor of a fly reel spool using an arbor knot. Tie backing to the fly line using a nail knot. Attach a leader to the fly line using a nail knot or a loop-to-loop connection. Discuss what good sportsmanlike behavior is and how it relates to anglers. Tell how the Outdoor Code of the Boy Scouts of America relates to a fishing enthusiast, including the aspects of littering, trespassing, courteous behavior, and obeying fishing regulations. Catch at least one fish.